HOUSTON (NYTIMES) - As south-east Texas residents emerged by the thousands from shelters, motels and friends' houses to return to flood-damaged homes, others remained in the grip of the crisis, cut off by still-rising floodwaters and living without running water for a second day. President Donald Trump will travel to Texas and Louisiana on Saturday (Sept 2), his second trip to the affected region this week, to review recovery efforts. In Houston and the surrounding area where the historic inundation from storm Harvey was mostly receding, people took to trucks and boats to get back into their neighborhoods on Friday, and many were appalled by what they found. Getting their first post-Harvey look at their north-west Houston home, Larry and Suzette Cade stood at the front door, holding hands and crying. "I just feel so sad and empty," Larry Cade said. 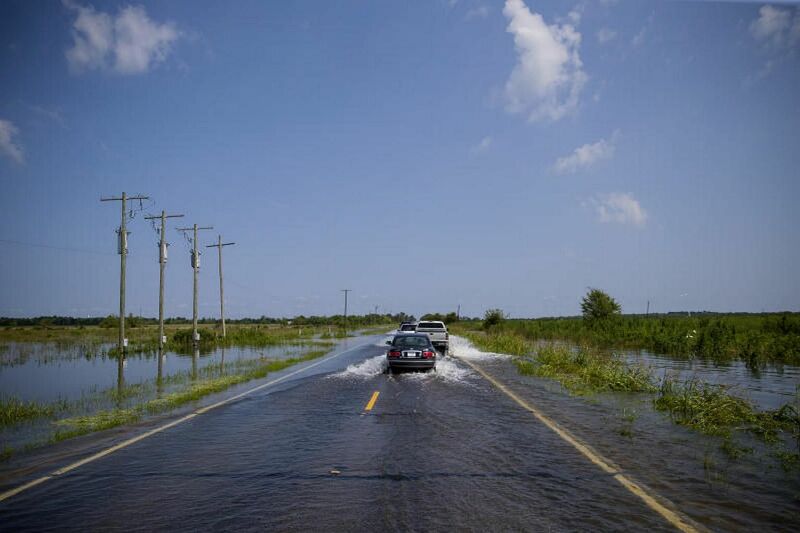 To the east, parts of Beaumont and surrounding communities remained isolated, with roads impassable and the Neches River still swelling, rising 8 ft higher than the previous record. It is not expected to crest until Saturday. The pumps providing fresh water to Beaumont, a city of almost 120,000, were knocked out by floodwaters on Thursday and remained shut down on Friday. Officials said they did not know when the system might be repaired. Late Friday, fire engulfed part of a chemical plant north-east of Houston, sending thick black smoke high into the sky, a statement from Arkema, the owner of the plant, confirmed. The plant was the same facility where, on Thursday, a chemical storage trailer exploded, setting off a fire, after flooding knocked out the refrigeration system needed to keep the chemicals stable. At least one of the trailers containing the chemicals was burning on Friday, a spokesman confirmed. "We will likely see additional incidents. Please do not return to the area within the evacuation zone until local emergency response authorities announce it is safe to do so," the company said in the statement on Friday evening. The chief executive of Arkema's American unit, Richard Rowe, had said at a news conference that it was only a matter of time before more of the nine trailers holding the chemicals exploded. He described the chemicals as irritants to the lungs, eyes and possibly skin, but it was not clear how much of a health threat the new release posed. A 480-km swath of Texas was a patchwork of places where people still grappled with the devastating aftermath of a storm that shattered rainfall records for the continental United States, and others where the crisis had abated enough for residents to begin to assess the damage and figure out how to rebuild their lives. Jana Swearingen had to hitch three separate boat rides, crossing from one patch of dry land to the next, to get to her job as a nurse at Christus Southeast Texas St. Elizabeth Hospital in Beaumont, from her home in Lumberton, just north of the city. She said the current was so strong in the bayou that it looked like white water rapids. Her heroes? "Just good old boys from around here," she said, piloting their own boats and taking people to safety. Even as the population of emergency shelters in Houston began to fall, it rose statewide, reaching more than 42,000 on Friday, with 3,000 more Texans in shelters in Louisiana, Gov. Greg Abbott said. He said 440,000 Texans had applied for aid from the Federal Emergency Management Agency. "This is going to be a multiyear project for Texas to be able to dig out of this catastrophe," he said. Local officials said there were at least 47 deaths in Texas that were related or suspected to be related to the storm. President Donald Trump will ask Congress to approve US$5.9 billion (S$8 billion) for disaster relief in the coming days, and US$6 billion more by the end of the month, White House officials said. 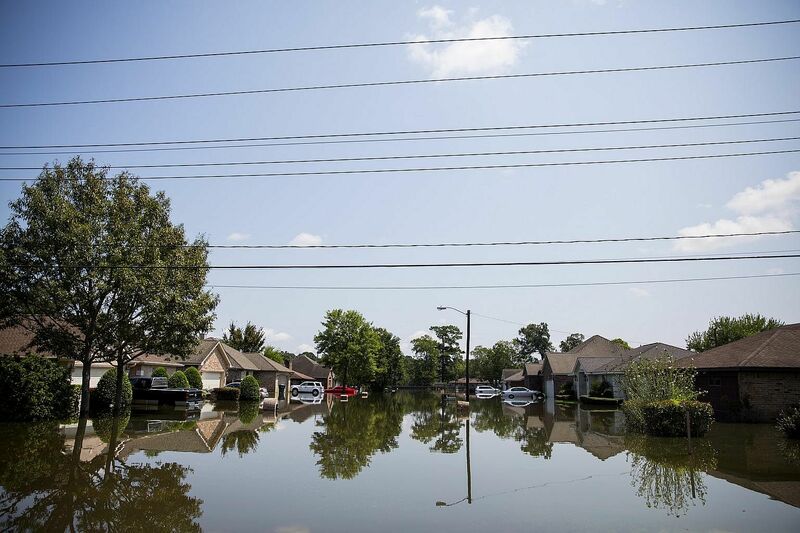 In Harris County, which includes Houston, the county Flood Control District estimated that 136,000 structures were flooded, but the water was receding in most places. People were eager to return home to pick up medications and family photos, to see if they could move back in, and mostly to answer the question that had gnawed at them for days: How bad is it? The Cades found that the brick house they have owned for a quarter-century seemed strangely unfamiliar. Their blue car had floated about 20 feet from where they had parked it and rested against a tree, 10 logs were scattered on one side of their lawn, and there was no trace of the mailbox. As Larry Cade, 63, tried without success to pry open the swollen front door, Suzette Cade, 62, peeked through the family room window, and saw how high the water had climbed, and that everything inside was upended. "Oh my God. Oh my God. Oh my God," Suzette Cade said softly as she again walked the perimeter of the house. "This is overwhelming. Everything is thrown everywhere." The flower pots she had collected for years were smashed or vanished, the fence had collapsed in a messy heap, the garage door was gone, and fish had found their way into the swimming pool. "Where's our deck?" she wondered aloud. It was uncertain how many of this region's residents have tried to return home since the storm - or how many no longer had intact homes they could return to. Local governments were just beginning the work of searching for the missing, and clearing roads of mud, uprooted trees and ruined cars. With several oil refineries shut down, Texas saw scattered fuel shortages, but the governor said the state had arranged for additional supplies to be brought in from Oklahoma and Louisiana. Flooding remained a problem for thousands of people who live just east of two overwhelmed flood control basins, the Addicks and Barker reservoirs at the western edge of Houston, and Mayor Sylvester Turner made a "strong request" that residents not return if there was water in their homes. Speaking at a news conference, Turner said the flooded homes were unsafe and were "creating an increasing strain on our first responders." As the Army Corps of Engineers releases water from the reservoirs into the Buffalo Bayou, he said, the houses in that area will remain waterlogged for 10 to 15 days. Even where the water had receded, homecoming had complications. 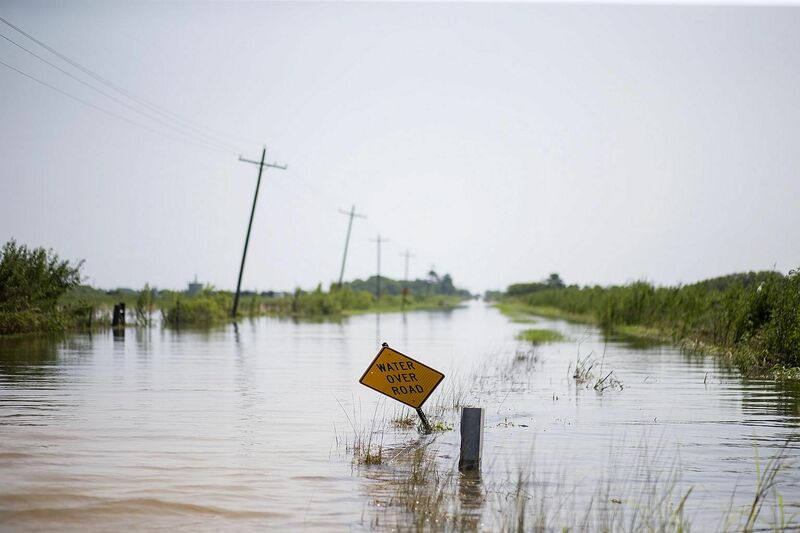 Authorities issued an array of cautions: Do not eat anything that had come into contact with floodwaters; wash hands after touching the water; check for wildlife, including snakes; and visit homes in daylight. And they have been passing around advice for disinfecting soaked furniture: one cup of bleach to 5 gallons (19l) of water. For Larry Cade, one of the greatest losses is not financial. Before he and his wife left on Sunday to stay at a hotel, he placed a photo of his mother atop a shelf. The picture, more than 50 years old, is so treasured that he can recall it with precise detail: he is a toddler wearing black shorts, suspenders and white, hard-bottom, high-top shoes; his mother wears a floral dress and holds his hand as they stand in Houston's 5th Ward. "As soon as I walked to the door this morning, I thought about my mom," he said. "That photo," he said, his voice thinned by tears. But the tumbled furniture the Cades could see through their windows left little hope that it had survived. "I thought the shelf was high enough," he said.